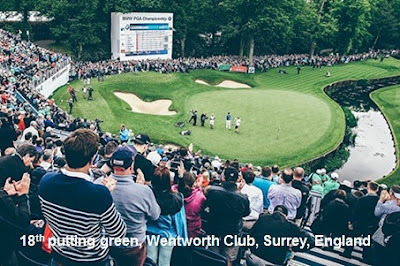 There were at least two interesting Rules incident at last week’s BMW PGA Championship at Wentworth Club, Virginia Water, Surrey, both of which involved South African competitors. Quite! I wonder if the official knew that Branden Grace had used the same Rule to obtain a similarly favourable relief 18 months ago. See this blog of mine for details. Incidentally, if an official had observed Grace digging into the sand with his feet and judged that he had done so in excess of what was necessary to obtain a firm stance for the intended stroke, he could have penalised him two strokes for a breach of Rule 13-4, as per Decision 13-4/0.5. (Edit 30th May 2017: There is a video of this incident at this link. I note from this video that the official permitted Grace to smooth the footsteps in the sand that he had previously made in digging-in for his stroke. In my opinion, this should not have been permitted. In any case, having received relief without penalty, the permitted area of drop was within one club-length of the nearest point of relief from the uncovered lining, which was outside of the disturbed area of sand. My opinion is based on part of Decision 13-4/11, though this refers to footsteps made in searching for a ball). Another interesting Rules incident happened at Wentworth on the same day, but this time no official was involved. Having reached the rough beside the green with his second stroke on the par-5 12th hole, Ernie Els was unsure as to whether his ball had plugged. Rule 25-2 only provides relief for an embedded ball in a ‘closely mown area’, but as is now the norm in most Pro competitions, the European Tour extends this relief by a Local Rule to ‘through the green’. Els was aware that he was entitled to lift his ball to determine whether it was embedded, which would entitle him to a relief drop, so he correctly announced his intention to his fellow competitors that he was going to mark and lift his ball to examine the lie. He quickly determined that the ball had not been embedded, so relief was not available. The Rules require that the ball must then be replaced with a fellow-competitor being given the opportunity to observe the replacement. "I just felt uncomfortable by the way the ball came out. The ball came out way too good, so I felt I didn't quite probably put it (back) exactly where I should have. Under the Rules you try and put it back the way you think it should be, but I still felt uncomfortable with it, so we took a two-shot penalty. I know deep down the ball wasn't quite where it should be and I wouldn't be able to live with myself." So, it was the fact he made perfect contact with his ball, resulting in his chip shot being holed, that led him to believe that he could not possibly have replaced the ball in exactly the same lie as to where it had been embedded and although no-one else was doubting the replacement, including a European Tour Official, who he consulted after the round, he ultimately felt that the best resolution was for him to self-impose a penalty of two strokes, under Rule 20-7, for playing from a wrong place. Kudos to a great golfer who is also a great example to those of us that love the game. Coincidentally, at the same time that many were complimenting Ernie Els for his absolute integrity in strictly following the Rules at Wentworth, others were raising questions as to whether Branden Grace had taken an unfair action to take advantage of them. Anyone purchasing my newest eBook, ‘999 More Questions on the Rules of Golf’ ($10.99/£7.99/€9.99) before Saturday 17th June, will receive a FREE copy of my eDocument, ’99 Tips on Using the Rules of Golf to Your Advantage’. Click here to purchase. I saw the relief that Grace got on TV and was wondering if it was okay for him to rake the bunker before dropping his ball? There is nothing in Rule 24-2b(ii), which I referred to in my blog, that permits the player to rake the area of their drop when taking the relief without penalty from an immovable obstruction in the bunker. could one use decision 24-2b/16 Obstruction Interferes But Ball Unplayable Due to Some Other Condition to not give a free drop? Would the player be allowed to make the stroke from the built stance and be assessed a two stroke penalty or would he have to re-create the area of where he had built the stance as it was originally and then make the stroke. I don't think that any Rules Official would have permitted Branden Grace relief in this circumstance, because the ball was unplayable. It clearly was playable, although in a difficult lie. To be fair in this circumstance, I don't think that the official did witness Grace's 'digging in', so he did not have to rule on the possible breach. My understanding is that a player who is penalised for building a stance in a bunker would be permitted to go ahead and play their stroke without having to smooth the built-up stance they had created. In most cases the penalty is imposed after the stroke has been made. Afa raking is concerned it is my opinion that the player was entitled to rake the footprints as long as it was only for the care of the course. Should he have dropped his ball in such a way that this raked area would then have been in play it would have been a penalty, IMO. I agree, a penalty would only be incurred if Branden Grace had dropped his ball, or taken a stance, in an area that he or his caddie had just raked.